Good Morning from New Orleans! I am in the south this week for the Pfaff Dealer's Convention, learning about the new machines we will be bringing into the store. 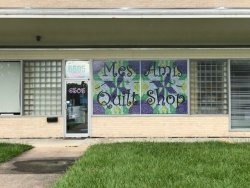 Yesterday, my adventures included going to two quilt stores featured in Quiltfolk Magazine in the Louisiana Issue. 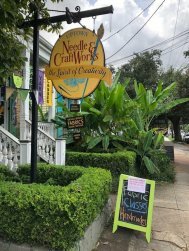 My first stop was at Uptown Needle and Craft Works! It’s a cute little store and I enjoyed meeting the owner, Emma! The store was very busy, as I found out that they are closing the store and moving to online sales! I know more and more stores are closing their location and going to online sales, but I do and will miss the ability to browse, touch, look, and visit with people. Wishing Miss Emma the best of luck, as her shop was cute and quaint! I'm glad I was able to stop-by before she closed! My next stop was at MesAmis and the staff there reminded me of Creekside! As soon as I walked in the store, they started up a warm and welcoming conversation and let’s just say, I ended my journey with two new friends! Denise, the owner, was just wonderful and I highly recommend, if you get down to New Orleans, stop in and say hello! 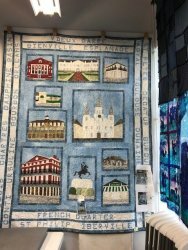 Here is a picture of her French Quarter quilt! 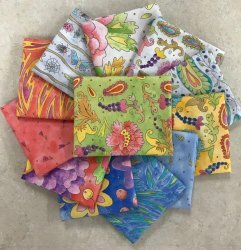 What's New at Creekside Quilting This Week! This past week, we received in this gorgeous Laura Heine fabric line! The colors are vibrant and the designs are so unique....truly something to see as the picture does not do the fabric justice! Karen M made this gorgeous Holiday Table Runner, using our William Morris fabric line and the Serenity pattern. Kit and pattern available at the store. 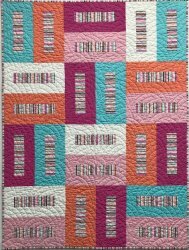 Barb created this new pattern and quilt sample, called Showcase a Stripe! Kit and pattern available at the store. Then we received in two new books. 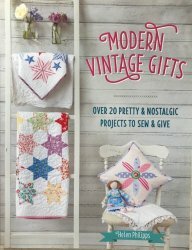 The first one is called Modern Vintage Gifts, and it has a lot of cute and simple ideas that could be used for holiday gifts. And Sewing by Heart came in the store also. 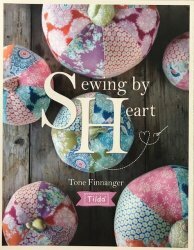 If you are a Tilda fan, you will love this book! See something you would like but don't have the time to get to the store? Just give us a call and we can mail it out to you! All class fees go straight to paying the incoming instructor! Kits for the class are additional! I'm happy to say, the classes are beginning to fill up! Friday, October 26th: Scissor and Knife Sharpening will be available at the store from 10:30 am-3:30 pm. Just in time for the holidays! Plan to bring your scissors and knives to the store on October 26th. November 10th: Easy Intentional Improv with Eva Marie Evans starting at 10:30am. Have you ever thought improv piecing looked like fun, but have trouble letting go of patterns and precision? Join us to make an improv block that can be turned into a pillow or joined with other blocks to make a larger quilt. Sample on display in store. Using a familiar intentional piecing technique, we will embrace improv and learn about the importance of color and value in composing our blocks. Improv piecing is the ultimate fabric play. Come have fun with us! November 30th and December 1st: Our Holiday Retreat is filling up fast! We only have space left for about 4 people, so if you are toying with the idea...you might want to solidify your decision one way or the other. This makes me so happy to see so many people interested in our retreat! Retreat dates: November 30th 5-9pm through December 1st 8am-4pm. The cost of the retreat will be $25 per person and will cover Friday night dinner, Saturday morning continental breakfast, and then a light lunch. We will also have two door prizes and a couple of fun give aways! We will provide: classroom space, electrical outlets, irons, ironing boards, cutting mats, ruler, and rotary cutter, all paper products for food and utensils. Please bring with you: your projects, sewing machine and sewing accessories, any special rulers, rotary cutters, mats, irons and any other specialty items needed to complete your project. Drinks with a lid and any snacks you may need to keep you sewing! Because this is an event and not a class, you will need to call the store or email me if you want to pay and sign up for the retreat. This weeks coupon will focus on Pfaff accessories. Are you in need of a special foot for you machine or some Inspira products? Let's take 15% off all Pfaff accessories or Inspira accessories. If we don't have it in stock, please place a special order, and I will order anything you are seeking next Monday when I return home. Have a great week! Happy sewing!